Two Americans who recovered from Ebola virus infections are contributing to doctors’ understanding of the deadly disease, a physician who treated them says. Kent Brantly and Nancy Writebol were infected with the Ebola virus in Liberia while working for Christian aid groups. They were evacuated from Liberia, treated for three weeks at a hospital in Atlanta and discharged this week. "They no longer have Ebola virus in their blood and therefore pose no risk to household contacts or the public," the U.S. Centers for Disease Control and Prevention said in a statement on Thursday. "There are no restrictions to the patients’ activities of daily living." Ebola is spread only through direct contact with the bodily fluids of sick people experiencing symptoms, according to the World Health Organization. Isolating and treating the sick is considered key to stopping its spread. 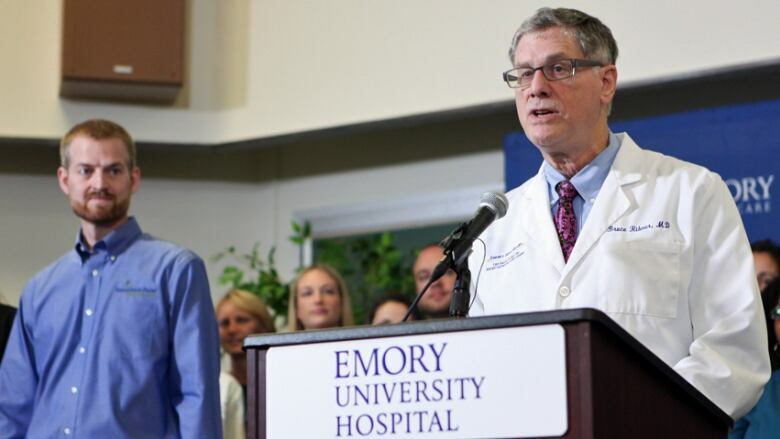 Dr. Bruce Ribner, medical director of the infectious disease unit at Emory University Hospital, was one of the five physicians and 21 nurses who treated Brantly and Writebol in the unit. "There may be some recovery time because this is a fairly devastating disease, but we would anticipate that in general most patients, if they have not had any substantial organ damage, will make a full recovery,” Ribner told reporters Thursday. Ribner said there was a "pretty gratifying feeling" once it was clear that both patients were going to recover. The treatment team at Emory learned several lessons from their Ebola patients. For Ebola patients who experience severe diarrhea and lose fluids, Ribner said it is important to replace potassium, calcium and other electrolytes. "One guidance we are giving back to our colleagues is that they need to pay attention to replacing these electrolytes," he said. "Even if they’re unable to do the same tests, there are things they can do to try to improve outcomes." Ribner said the Emory team also observed clotting abnormalities in their patients. Writebol and Brantly enjoyed better nutritional status compared with some patients in West Africa, which is also important to recovery. There’s been a lot of attention on experimental treatments for Ebola virus, such as the ZMapp cocktail. Writebol, Brantly, three Liberian health-care workers and a Spanish priest also received ZMapp. The U.S. manufacturer of the experimental cocktail says it has run out. "Frankly, we do not know whether it helped them, whether it made no difference, or even theoretically if it delayed their recovery," Ribner said of the experimental treatment. No one knows when or how the U.S. patients were exposed. In a statement, Brantly said they took every protection to protect themselves by following guidelines from WHO and Doctors Without Borders.